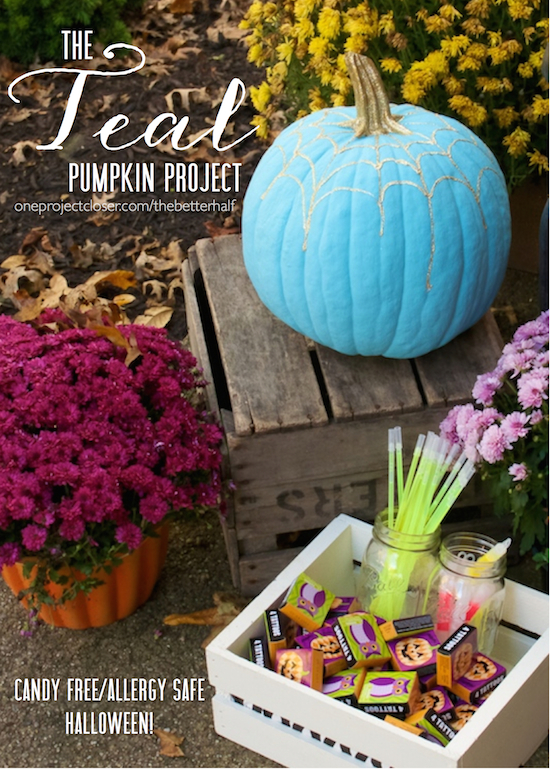 The Teal Pumpkin Project: Allergy Safe & Real Food Approved! 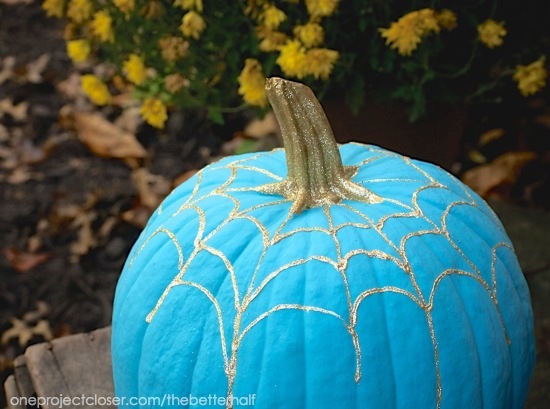 This post originally ran in October 2013 but I wanted to share with you this spiderweb glitter pumpkin that I created last year in support of The Teal Pumpkin Project! I still love this non-food, allergy free alternative to even more candy for our kids! Have you heard about The Teal Pumpkin Project, promoted by FARE, Food Allergy Research & Education? 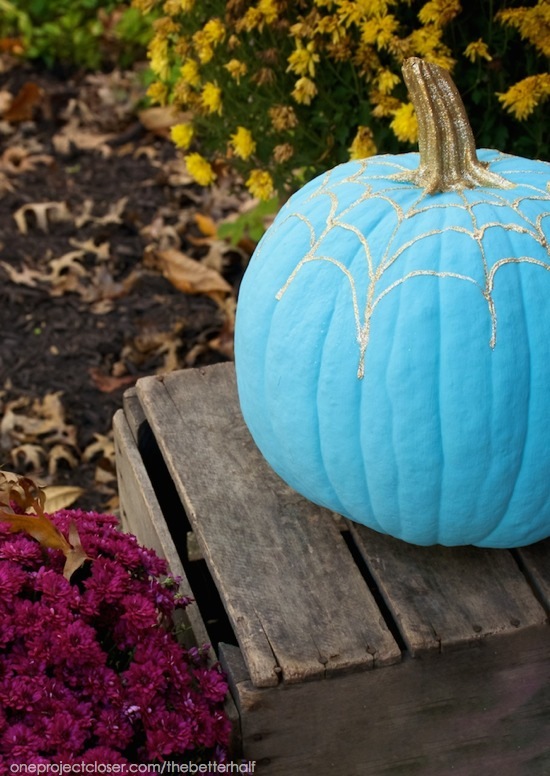 The idea is to paint a pumpkin teal and put it on your porch, signaling to Trick or Treaters that your home is providing non-food/candy options for kids that have food allergies. Pretty cool, right?! Before I even heard of the Teal Pumpkin Project, I had planned to pass out glow sticks and tattoos. I figure the kids get more than enough candy, and non-food treats might be a welcome (and real foodie) treat! So, I finally bought my pumpkin a few days ago, busted out my teal DecoArt Chalky Finish Paint, and started painting. Lucy (age 3) thought painting a pumpkin was a bit crazy, but she bought in fairly quickly! After it dried, I painted the stem and added a spider web with Elmer’s Glue and then added lots and lots..and lots of glitter. It made my heart happy. A bit of a disclaimer though, if you plan to put your pumpkin outside and keep it there, do not use Elmer’s, since it is water-soluble. Once it was all done, I went outside for a photo shoot. My dad happened to be over so I could help him shop for chairs for his photography studio. As usual, I was struggling with my photos, lighting, white balance, the works. And Daddy to the rescue. It sure is nice to have a professional photographer for a Dad. And he worked his magic off the cuff and in ten minutes. Thanks, Daddy! 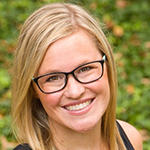 He also snapped a few pix of me (sans makeup, but still love them). Thanks again to Dad at Chris Paulis Photography for these fabulous pix! You’re the best!! What do you think? 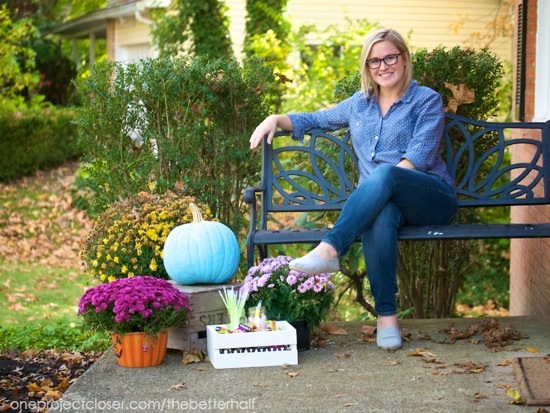 Are you participating in The Teal Pumpkin Project? 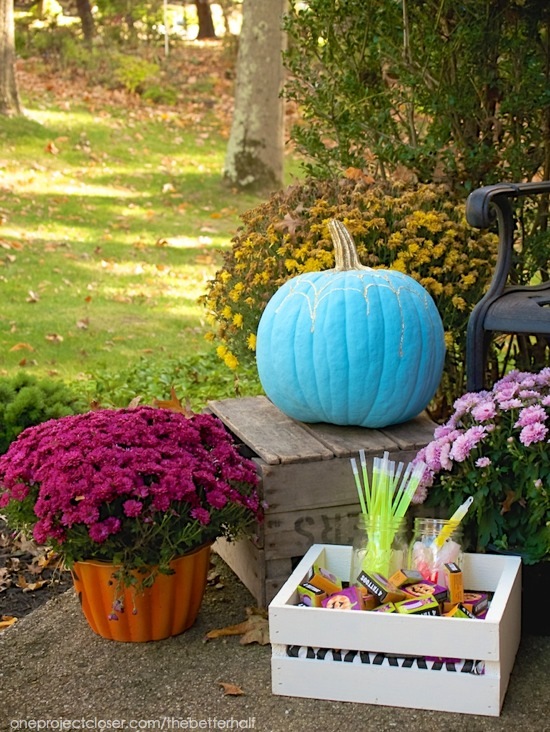 What are you handing out this Halloween? awww thanks so much Lesley!